Vintage black and gold design glass measuring 3 1/4 inches in height. 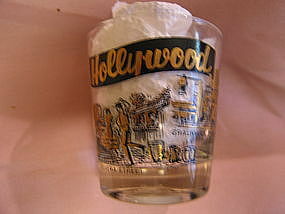 One side says Hollywood and the other side has Los Angeles printed. Additional identification photos by email. I need your zip code to calculate the postage. 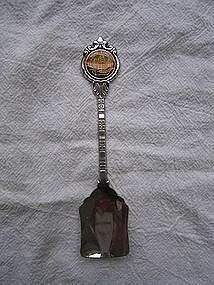 Silver plated butter spreader. There is minor wear to the "ng" of Kong. The back of the blade has a small dot of what looks like loss of silver. Additional photos by email. 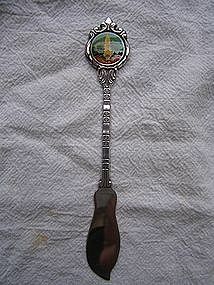 I have a Stuart Hong Kong spoon (has a different crest) available for purchase. I need your zip code to calculate the postage. 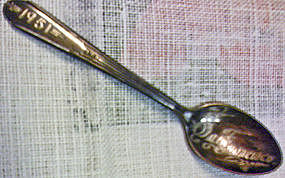 Souvenir silver plated spoon manufactured by Stuart in New Zealand. Additional photos by email. 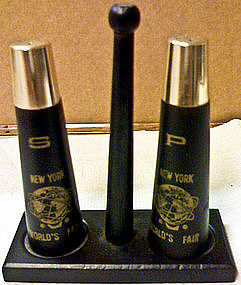 I have a Hong Kong butter spreader available and priced individually. I need your zip code to calculate the postage. 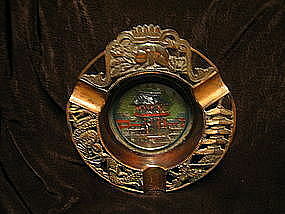 Vintage metal ashtray with glass dome over pagoda scene. I believe it is just a copper finish, but really don't know. It measures approximately 5 1/2 inches. I need your zip code to calculate the postage. 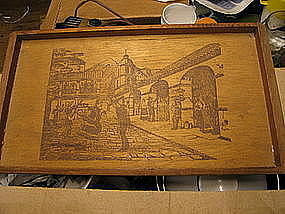 Vintage tray with Mexican village scene. It measures approximately 14 x 12 inches. Minor age related wear to the surface. I need your zip code to calculate the postage. One ounce shot glass. There is no damage. I need your zip code to calculate the postage. 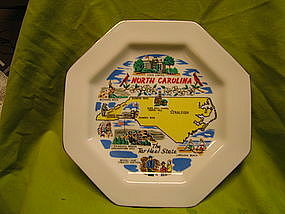 Souvenir 7 1/2 inch plate manufactured in Japan. Minor wear. I need your zip code to calculate the postage. 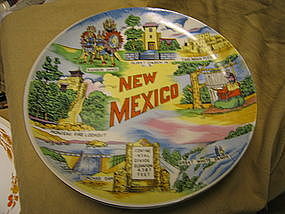 Vintage 8 inch porcelain plate from New Mexico. It has a wire on the back for hanging. There are no chips, cracks, breaks or rough rim, but does have manufacturing flaws. I need your zip code to calculate the postage. 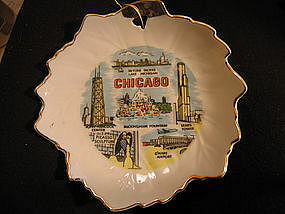 Souvenir Chicago plate measuring 4 3/4 inches. I suppose it is from Japan, but the original price sticker is covering the information. I need your zip code to calculate the postage. 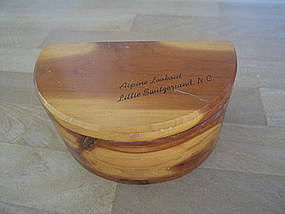 Vintage souvenir toothpick holder, measuring 3 inches in height. 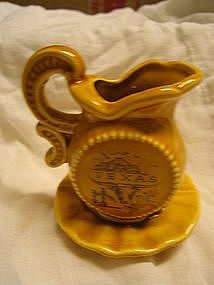 It looks like a pitcher and bowl, but is one piece. It has Japan sticker. There is no damage. I need your zip code to calculate the postage. 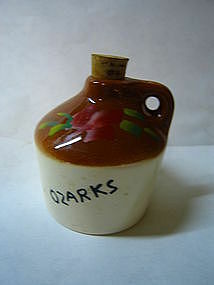 Vintage souvenir mini jug measuring approximately 2 1/2 inches in height. There is no damage. 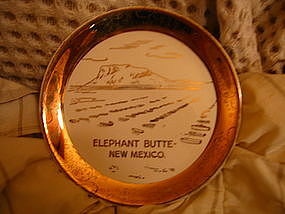 Vintage 7 1/2 inch souvenir plate from Elephant Butte, New Mexico. There are no chips, cracks, breaks or rough rim, but does have wear to the gold trim band. The white spots are glare and not the wear. I need your zip code to calculate the postage. 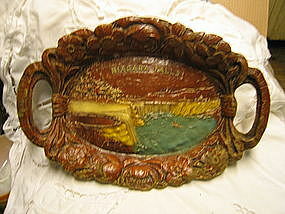 Vintage Burwood Niagara Falls tray. 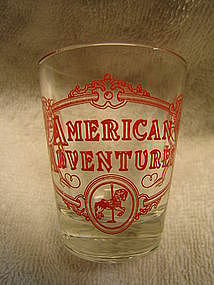 The back of the tray features American Falls. 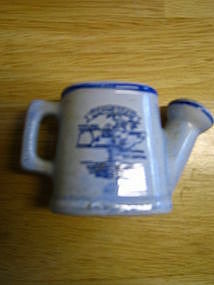 It measures 12 x 8 1/2 x 1/2 inches. As shown in the photo, there is wear to the finish. I need your zip code to calculate the postage. Manufactured in Japan. It has 2 holes. 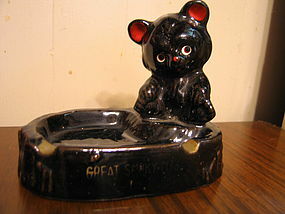 Original stopper. No damage, but there is a manufacturing flaw of smudged blue paint on the front. I need your zip code to calculate the postage. Wooden salt and pepper set with wooden holder. There is no manufacturing information, but looks like a Japan production. The shakers are 4 inches in height. There are two small areas of loss of black paint on the back of the salt, as well as a bit of filmy appearance to the lid. It looks like residue, but did not want to damage the lid finish. There is minor wear to the gold graphics. Complete condition photos by email. I need your zip code to calculate the postage.